I’m not sure if “Failure is a Necessity” or “Failure is not an Option,” better describes the philosophical underpinnings of my third attempt to reach Acid Beach, and its surrounding wonders. But, I do know “The Third Time is the Charm” aptly describes the effort. It was exciting, trying, scary at times, frequently beautiful, peppered with odd moments, and great discoveries. Interestingly, after reaching my goal, the return trip was the most physically demanding. That was because I ended up caught in the dilemma featured in many stories and films, where the protagonist, having found the weighty treasure they had so fervently sought, often gold or heavy jewelry, must abandon it, in order to survive the ordeal of returning to civilization. Only I wasn’t about to give up my hard earned treasure. Last week I noticed that on the upcoming Presidents Day, there was going to be a nice 1.1 minus tide at about 3 in the afternoon. Perfect for my third serious effort to reach Acid Beach and Warm Water Lagoon. the towering cliffs. For the first mile it was just a holiday stroll, until we got to the inlet that reaches into the foot of the cliff. On our last outing, Meg decided not to get wet, and waited on the south side of the inlet as the potential 911 caller. When she saw that the winter waves had sucked two feet of sand out of the inlet, making it even deeper then before, she once again chose the sensible option. 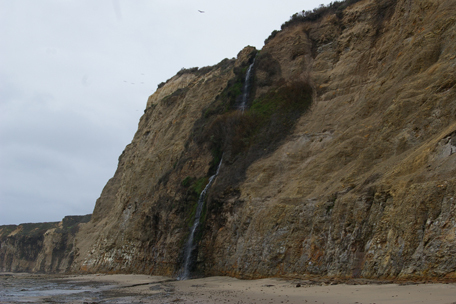 I, on the other hand, tried to repeat my risky climb along the cliff-side, above the inlet. But I’m afraid I was too sensitive about crunching the barnacles and mussel colonies underfoot, as I slowly retraced my previous path. Placing one foot in an open, but very slimy spot, I slipped and rather than be keelhauled by the mollusks as I slid down the cliff’s face, I launched myself into the mid-thigh-deep water, holding my camera high. Moving fast before another wave surged into the channel, I pulled myself atop a rock that was only partially submerged, waited until the wave’s surge retreated, and quickly waded to where I could pull myself out of the water. Great!, my swimming trunks and the wetsuit booties I’d brought to use while wading around “Chicken’s Roost”*** were still safe and dry in my pack, but my clothes and boots were soaked. Ten minutes later, I watched as a sizeable group of sunning Harbor Seals, seeing me approach, began galumphing into the water from their sandy resting spot below a waterfall. All except one that remained motionless on his back. I remember thinking, well, this is one dead marine mammal not even Ray Bandar, “the bone collector,” is going to be able to collect a skull from. 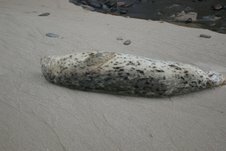 Walking up to the seal that wasn’t moving, I shot a picture, then noticed his little flippers waggling slightly. Believing the seal to be unwell, and not wanting to add any more misery in its final moments, I took one more photo and trudged on. Fifty yards further, I happened to glance back to see it steaming towards the water. The little feller must have been in a deep sleep, probably dreaming of somersaulting through the sun-streaked kelp beds, chasing some yummy fish, as I had approached and his buddies had fled without waking him. I guess they don’t get many visitors at this end of the beach. Another five minutes, and I was at Chicken’s Roost, my own previous turnaround spot. Already soaked, I left my trunks and booties in my pack, stuffed my camera in, too, and began to wade around the face of the Roost. Trouble greeted me immediately. The footing was uneven and large seaweed fronds obscured my vision of the bottom and made every move a slick and risky proposition. Two steps, and I almost went down, forcing me to grab the pockmarked cliff face. Unfortunately, the pockmarks were created by sea urchins, and more then a few were still home and apparently resented my visit. Excusing myself with a curse, I edged along the cliff, looking for uninhabited pits to stick my fingers into. With my back to the surf, I didn’t see a big wave that smacked me into the cliff, its rebounding spray needling me in the face. Before my courage sank and drowned, I made it as far as a rock jutting slightly above the water, at the mouth of the slotted inlet just past Chicken’s Roost. This was the same slot I became familiar with on my first trip, I had been afraid I was going to fall in from the Roost’s top, ruining my camera, and maybe drowning after hitting my head. But not this time. Having reached a secure spot, I took a moment to survey my situation and didn’t like what I saw. There, bobbing in the water in the slot, five feet in front of me, was a dead Harbor Seal. To my left, ‘round the next rock where I had planned on going, I could see the water was much deeper, the bottom invisible even in the relatively quiet times between waves. It looked like I was going to have to traverse the slot, push the corpse out of my way, and climb up a narrow, mussel-choked crack in the cliff. Oh joy. But. I’d come too far to turn back now. I waited for a calm moment between waves and lowered myself back into the water. When my tiptoes still hadn’t touched bottom with my belt well under water, I knew I was beaten. I was at the edge of the wader’s equivalent of a sucker hole, guarded by a dead, floating portend. I pulled myself back up on the rock, and retreated the way I came. Defeated again!? Reaching terra firma, I stood looking up at Chicken’s Roost, feeling checked if not checkmated. I took a deep breath and started to climb it. Reaching the top, I crossed it and looked down at the steep scree slope that had sapped my courage on my first trip. It didn’t look inviting, but after what I’d already been through on this trip, the slope didn’t seem that fearsome. I was sure I could get down it, getting back up would have to be dealt with later. 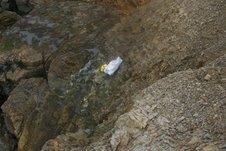 In desperation, I supposed I could always throw my pack with the camera up from the beach below, then, swim around. At this point even this shaky plan was enough when faced with the “Failure is not an Option” thoughts that were jabbing my ego in some of its most vulnerable areas. I started lowering myself carefully down the treacherous slope. Seconds later I was standing triumphantly on solid ground, even though it felt like I was floating on air. There was nothing that could stop me now. And nothing did. Except for the clusters of buoys I started encountering. 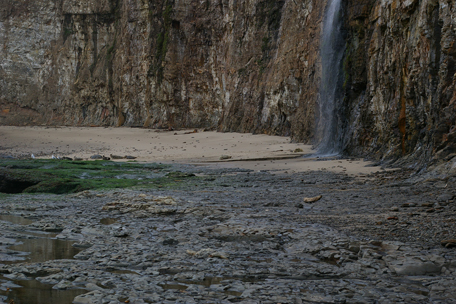 The first cluster was below the rappelling spot where the Pranksters are reputed to have lowered themselves down to enjoy the inviolate privacy of this isolated beach (Acid Beach?) for their Bacchanalian psychedelic happenings. A nice mix of about a dozen floats, all within twenty feet of each other, were mine for the taking. I gathered them in a pile, promised I’d be back to collect them, and headed north. Soon I saw Warm Water Lagoon, its waters almost completely drained by the low tide, except for a large pool at the arches’ double-barreled opening into the lagoon and the narrow surge channel from the south. was another cluster of floats and buoys. I stuffed my pack full, left it there and walked into this amazing feature: Warm Water Lagoon. On the right, and curving around in front of me, were sheer hundred foot cliffs. 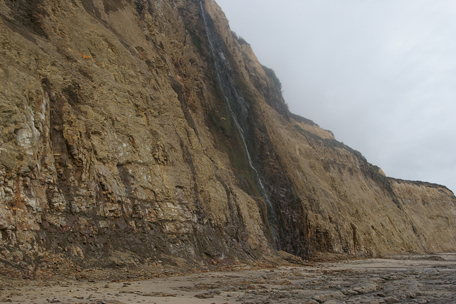 Seaward, on the left, a spine of sandy rock descended from the northern cliffs, reaching sea level where the surge channel at the south enters the lagoon’s mouth. The spine is only broken by two sea level tunnels through it that form an impressive double arch with a huge pillar of rock separating the two tunnels. Waves were surging through the tunnels, spreading out in a beautifully symmetrical fan across the waters of the lagoon. 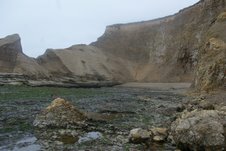 To the best of my knowledge, there’s no more awe-inspiring scenery and no more beautiful arch, on the entire San Mateo Coastside—and it’s virtually unknown and less visited then the North Pole. Yet on the beach, to the right of the arches, just exposed by the fully-ebbed tide was a seemingly new, ten- foot pole with a line-loaded reel, looking as if it just fallen from the rack in a sporting goods store. I picked it up and started my return. Having left my pack at the opening, I soon stuffed my pullover’s pouch full with the smallest floats I found along the lagoon’s beach. When my arms could no longer manage both the rod and reel and the larger floats I was also collecting, I started to thread them over the end of the pole. I marched southward carrying it like a banner pole for my expedition of one. Reaching my backpack, I pulled out a huge bag I had brought and stuffed everything I was carrying into it and headed south. 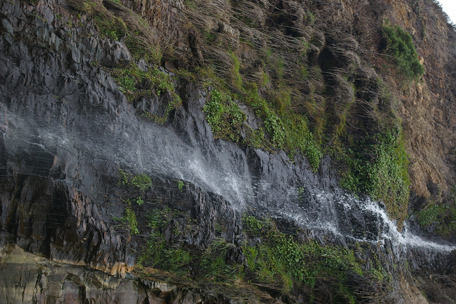 As I marched along, I noticed a roomy ledge above me at the foot of one of the waterfalls. Curious, I stopped and climbed up to find another dozen floats, several varieties I hadn’t seen in many years. My pouch and hands full, I carefully climbed down and stuffed them into my bag, and resumed walking. By the time I reached the rappel spot, I picked up another half-dozen floats that I missed earlier because I was intently focusing on my goal. Both my backpack and big bag were now bursting and I still had a dozen more in a pile on the ground before me that I had promised to rescue. A delightful dilemma for a float collector. Searching around I found a length of seaweed, stripped it of its branches, and threaded five of the largest buoys in the bag on it. Stuffing the rest in the room created in the bag by removing the five, I was ready to move on. that I just couldn’t pass up, even though I don’t normally collect them. Over my shoulder, held in place by my other hand, was a gigantic bag stuffed with dozens of buoys and floats. The only thing ruining my ecstatic state was worrying about whether I would make it through the upcoming obstacle course, especially up the Chicken’s Roost slope with my hands otherwise occupied, I wasn’t sure I could manage it all. 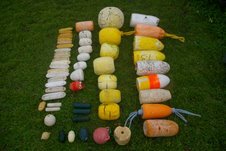 I was carrying more floats and buoys that I’d ever collected from one place before. I didn’t want to leave anything behind, but what if I was forced to abandon my treasures, as so many others had in those books and films I’d mentioned? Nooooo! By the time I’d reached the Chicken’s Roost slope, I was once again brimming with confidence. I’d simply strip some line off the reel, tie it to the buoys, climb to the top and drag them up one at a time, if necessary. But, nothing so time-consuming was necessary. The first climb up I took the fishing pole in one hand, and used the other free hand to feel around for solid projections jutting from the scree. The rod and reel actually helped, as I wasn’t worried about damaging it. By jamming the rod and reel into the slope, it assisted me from slipping and sliding. Triumphantly reaching the top, I deposited my load, celebrated for a few seconds, and headed back down for the next two trips. The big bag was the most difficult because of its bulk and weight, but nothing was going to stop me now. The remaining part of the return trip was a struggle that left me sore for a couple of days. But, even soaked, scratched, scraped and aching, I was not miserable. I was on a natural high. When I reached the inlet where I received my first dunking, now surging with the returning tide, I just jumped in and waded across with my camera held high, the fishing pole in my other hand. One more trip and I had the bag and seaweed necklace securely on the victorious side. Until then I’ll just savor my treasures, shown laid out on my front lawn in this picture. 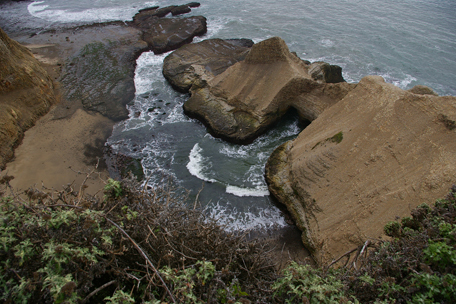 Chicken’s Roost (my name for a nameless rock) is the spot I turned around at on my first attempt to reach Acid Beach in December. I think you published a picture of it in the story of that trip. 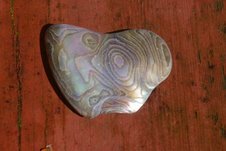 This entry was posted in Acid Beach, Chicken's Roost, John Vonderlin, South Coast beaches, Warm Water Lagoon. Bookmark the permalink.